Terrence Cole, Mary Ehrlander, and William Schneider display the awards they received at the AHS Annual Meeting in Nome, Alaska, September 2018. Photo by Ron Inouye. Each year the Alaska Historical Society recognizes, through its awards program, individuals, historical societies, and public institutions for outstanding research, writing, and promotion of Alaska history. All award winners are selected by the Alaska Historical Society Awards committee based on nominations made by the public. Select a link from below to view past award recipients. The James H. Ducker Historian of the Year Award is given to an Alaska resident for publication of important new material about Alaska history during the past year. The award recognizes historian James Ducker who edited the Society’s scholarly journal for 30 years. The award includes a cash prize. The Esther Billman Certificate of Excellence is given to a local or state historical society, museum, government agency, or an organization for a project contributing to the preservation and understanding of Alaska history during the past year. Esther Billman was the longtime curator of the Sheldon Jackson Museum and a leader in the preservation of Alaska history. The Evangeline Atwood Award for Excellence is given to an individual for significant long-term contributions to Alaska state or local history. 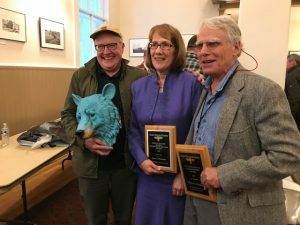 The award is named for one of the founders of the Alaska Historical Society who wrote, supported, and advocated for Alaska history from the 1940s into the 1990s. The Barbara Sweetland Smith Pathfinder Award recognizes contributions to the discovery and description of resources relating to Alaska history. Barbara Smith was a historian, archivist, and exhibit curator who contributed much to Alaska history and to the Alaska Historical Society. The Contributions to Alaska History Award is special recognition to individuals or groups that have made significant contributions to the Alaska Historical Society and the promotion and understanding of Alaska history. The Elva R. Scott Local Historical Society Newsletter Award recognizes a community historical society or museum for its newsletter, a publication, programs, or other significant recent accomplishments. Elva Scott was a founder of Homer’s Pratt Museum and after moving to Eagle was the newsletter editor, tour guide and officer of its historical society. The President’s Award/Beaver Log is given by the Society’s president for outstanding contributions to the society. The Student and Beginning Professional Travel Scholarship Awards are cash awards given to help individuals attend and participate in the Alaska Historical Society’s annual meeting and conference. The Special Award recognizes those who have made significant special contributions to the Alaska Historical Society and the promotion and understanding of Alaska history.